This year, on the 40th anniversary of the Slavic Pope election, representatives of the two John Paul II Foundation Canadian Chapters decided to honor this anniversary in a special way. President of the JPII Foundation Saskatchewan Chapter (established in 1997) – Bożena Kilanowski and JPII Foundation Edmonton, Alberta Chapter (established in 2016) – Agnieszka Koziarz in cooperation with the Pastor of the Holy Rosary Polish Parish in Edmonton, Fr. Mieczysław Burdzy and the representative of the John Paul II Library in Edmonton met with the parishioners after the Mass on Sunday, October 14, 2018. Exactly on that Sunday, called Papal Sunday in Poland after each Mass funds for the Papal Foundation “Work for the new Millennium” were collected. This year “Fatherhood radiation” from the Karol Wojtyła’s book was selected as the motto of that day. All participants were greeted by the representative of the John Paul II Library in Edmonton – Mr. Ryszard Kazek. Then, Bożena Kilanowski presented the John Paul II Foundation in Rome. She explained that the John Paul II Foundation was established by the Papal Decree on October 16, 1981 as a Church, no profit organization which is supporting educational, science, cultural, religious and chartable initiatives related to the Holy Father John Paul II Pontificate. The main goal is to preserve and cultivate the spiritual heritage of John Paul II and Christian culture. The John Paul II Foundation gives scholarship awards to young people from Eastern Europe and Asia to study at the Catholic University of Lublin and John Paul II Papal University in Krakow. The JPII Foundation also takes care of documentation and stadium of the Pontificate and is disseminating knowledge about the John Paul II teachings. Among many materials related to John Paul II (folders, books, the Foundation album, VCR, image of the Pope) Bożena Kilanowski presented five books published by the John Paul II Foundation – The Center for Documentation and Research of the Pontificate of John Paul II. The books were donated to the John Paul II Library on hands of Mr. Ryszard Kazek. In return, as a token of gratitude, a donation for the John Paul II Foundation in Rome was given. Thank You so much! 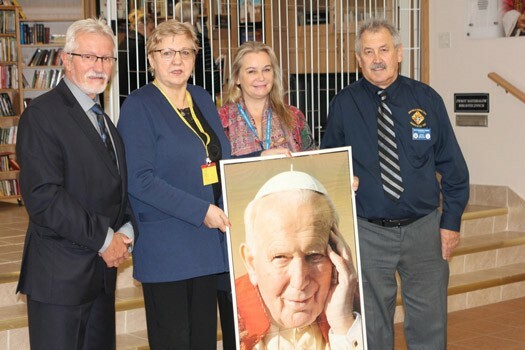 Then, the president of the JPII Foundation Edmonton Chapter – Agnieszka Koziarz encouraged gathered people to get involved and help this great deed, which the John Paul II Foundation is. One of the presented books (available also in English) had the title „Do not cease this good work – Papal addresses to the John Paul II Foundation” – is a plea directed to all to help to “build the monument made of culture and science bronze” (words of John Paul II). 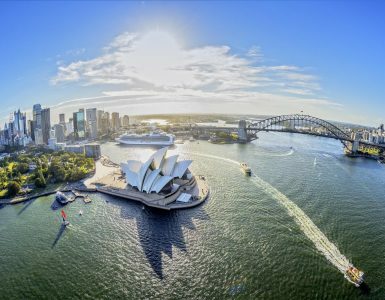 This living monument which the John Paul II Foundation is has one of its goals to pass on the heritage of the John Paul II Pontificate to the next generations. A lot of nice words directed to the Foundation were delivered by Sister Benedyktyna, superior of the Sisters of the Immaculate Conception of the Blessed Virgin Mary. Sister Benedyktyna agreed to cooperate with us, as she has an experience from prior work with the Papal Foundation in Poland. At the end of the presentation, Bożena Kilanowski presented one of her poems from the book “Written by heart – diptych with poetry for St. John Paul II”, published two years ago in Rome by the John Paul II Foundation on the 35th anniversary celebrations of the Foundation. After the verbal part, a delicious dinner (thank you!) was served by the Knights of Columbus. It is worth to mention that the Knights of Columbus, council #11334 in Edmonton selected St. John Paul II as their Patron. The Grand Knight, Mr. Kazimierz Zięba invited us to the Knights of Columbus’ meeting held on October 18, 2018 in which Agnieszka Koziarz participated and made a presentation. The meeting provided an excellent opportunity to discuss future possible cooperation. We would like to express our deep gratitude to Mr. Ryszard Kazek (also one of the Knights of Columbus) who during a meeting accepted to serve as the Vice-president of the JPII Foundation Edmonton Chapter. President of the JPII Foundation Saskatchewan Chapter, Bożena Kilanowski, went back to Saskatoon, Saskatchewan. On Tuesday evening of October 16, 2018 at Our Lady of Czestochowa Polish Parish during the Mass celebrated by the Pastor Fr. Andrzej Wychucki the celebrations of the 40th anniversary of Cardinal Wojtyła’s election were continued. Also, in Edmonton, on the same day and the same time a Mass was celebrated by the Pastor Fr. Mieczysław Burdzy. The Mass was attended, among others, by Knights of Columbus and members of the Chapter. After the Mass, a procession with the relics of St. John Paul II went outside to the John Paul II monument to pray and unveiled a memorable plaque. The plaque contains the most important dates and events from the Great Polish Pope’s Pontificate. This plaque serves all who are visiting the Church and do not know much about the John Paul II Pontificate. The plaque was sponsored by funds collected during the Parish’s picnics organized by the Parish Events Committee in the past six years. The John Paul II monument and plaque was created by Professor Czesław Dźwigaj from the Academy of Fine Arts in Krakow. The monument was placed ten years ago, while the plaque was created this year. The plaque was sent to Canada and installed on October 15, 2018 by Mr. Garry Kokolski’s company – Edmonton Granite Memorials. On the Pastor’s request, the plaque was unveiled by Mr. Ryszard Kazek who coordinated efforts to place the plaque. Fr. 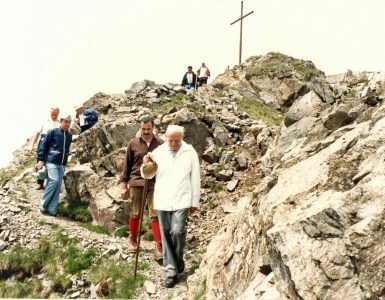 Mieczysław blessed the plaque and led the Litany to St. John Paul II. Votive candles were placed under the monument while faithful people placed flowers. The Knights of Columbus also placed flowers as well as Agnieszka Koziarz and representatives of the Edmonton Chapter placed a wreath made from white and yellow roses. Remaining in the prayerful posture, the relics of St. John Paul II was placed back in the altar. 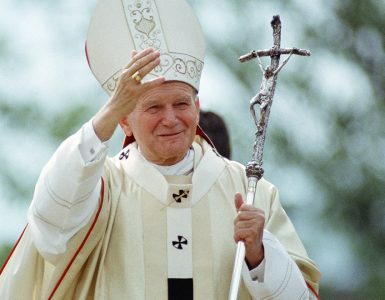 Pray for us, Saint John Paul II, so we could through our lives and in our words proclaim Jesus Christ, the Redeemer of the world. 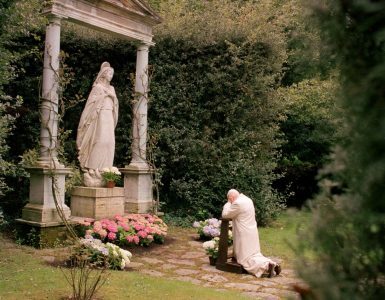 Merciful God, please accept our thanksgiving words for the gift of the apostolic life and Pontificate of St. John Paul II. Amen.